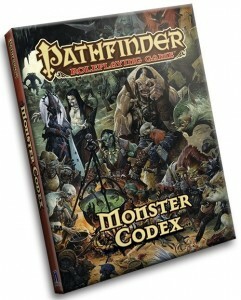 Paizo’s new Monster Codex for the Pathfinder Roleplaying Game provides an in-depth look at 20 monster types, including orcs, ogres, trolls, kobolds, and more. For each, the book includes detailed background information, sample encounters, special material (such as feats and magic items), and a series of new stat blocks covering a range of challenge levels. Another feature of the Monster Codex is a set of simple class templates, which is a way to add character-class features to a monster without having to go through the usual tedious level-by-level process.